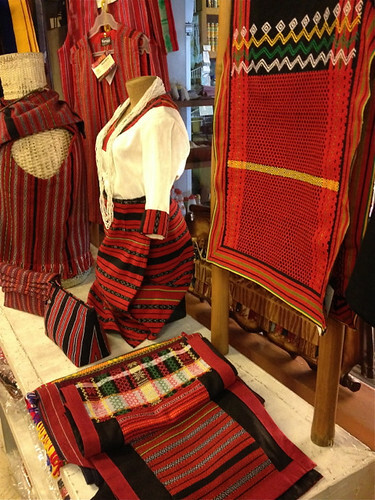 I had thought that one of the possible pleasures of travelling in the Cordillera region of the Philippines would be to see some of the weaving for which the region is known. Traditionally, both the women and men of the region wore either short wrapped skirts (women) or longer strips of elaborately tied fabrics (men) that were woven in colours and patterns that identified their ethnic affiliation. 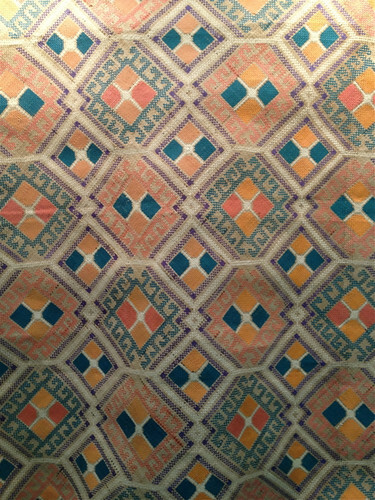 The fabric is densely woven on backstrap looms, usually in stripes with more complex inlaid borders. We saw some of the weaving on our travels - but nothing that I admired enough to buy. I already have a stack of Philippine weaving that languishes on my shelves, bought over many years. Much of what I saw on this trip was, sadly, of lesser quality than the older cloths I already have and so there was little motivation to buy more (other than the desire to support local crafts - but I have to stop somewhere) . I guess this decline in quality is inevitable. 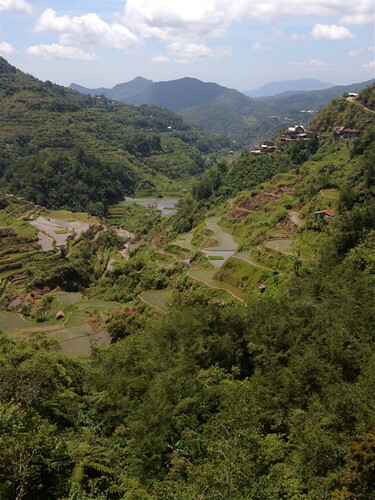 As I wrote in my post on the rice terraces, people in these regions now have more knowledge of the world beyond their mountains and valleys and more options, whether real or imagined, for earning their living. Weaving is time-consuming and, like all handicrafts, brings few financial rewards for the time spent. As the traditional fabrics transition from items of everyday wear to souvenirs for tourists the imperative for weaving wanes and skills are lost. By the way, I love the photo of Narda herself on the website, dressed in a wonderful riot of local weaves. However,I think you'd have to be (a) tiny and (b) a Filipina to carry off this look successfully! 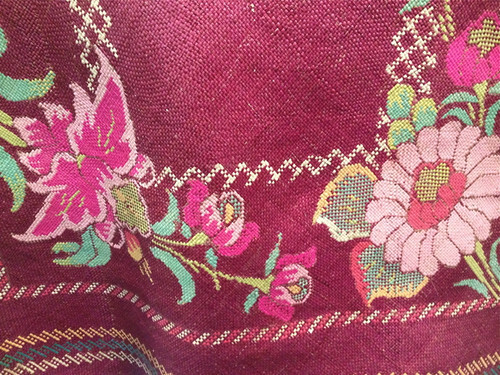 You can see I was rather taken by the scarves that had detailing of small pearls or shell beads. The carry-bag in the background of the photo of my purchases was not from Narda's but from the very sophisticated giftshop at the BenCab Museum. 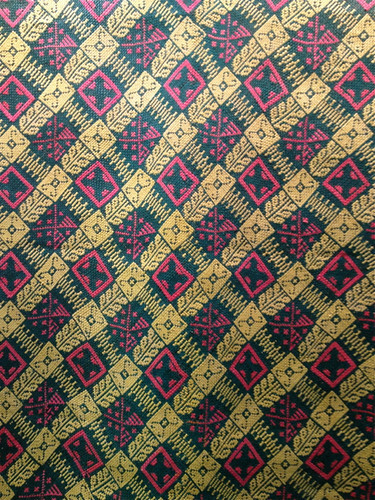 The checkered fabric in this bag is 'abel' and is from the coastal region of Ilocos that borders the mountains, where the use of floor looms rather than backstrap looms enabled different weaving techniques to be used. 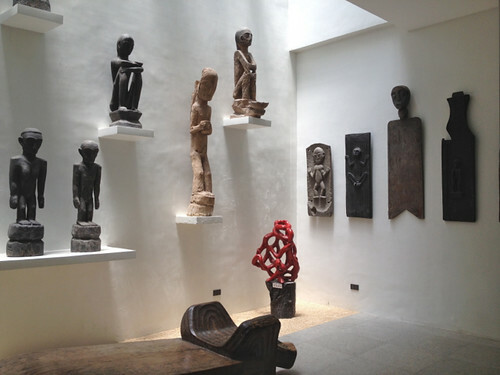 Benedicto Reyes Cabrero, most commonly known as BenCab, has built a modern, light-filled museum with extensive gardens just outside Baguio with galleries for his own work, the work of other modern artists and, most interesting for me, an extensive and well-displayed collection of wood carvings that are such a rich artistic tradition for the Cordillera region. BenCab's work is very accessible and widely known, though not always critically acclaimed and he has been designated a National Artist of the Philippines. 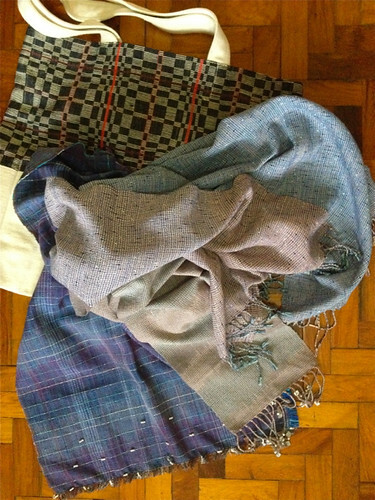 My fabric search was not particularly successful but, even so, it seems impossible for me to visit the Philippines without in some way reconnecting with its craft traditions. 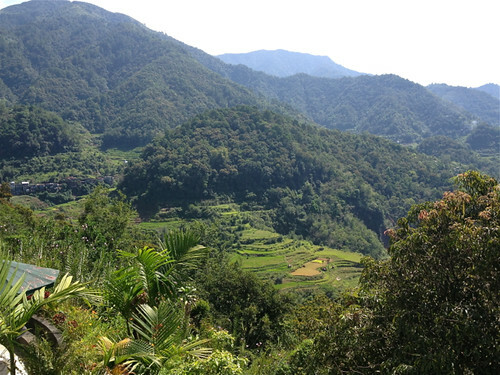 We've returned from seven days' travelling through the mountainous Cordillera region of the northern Philippines. I've always scoffed a bit at the notion of 'bucket lists' - things you think you would most like to before you die - because it seems to me that enjoying what life offers up to you can be even more enriching. 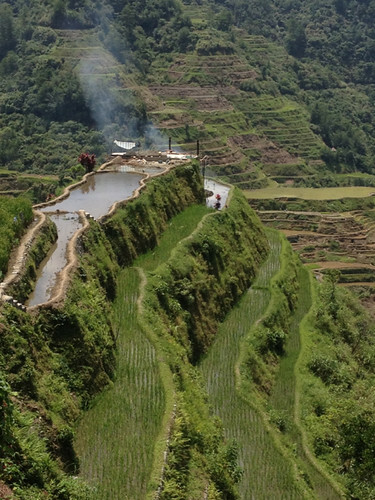 But I must confess that I've had a hankering to revisit the Cordillera region of the Philippines before I'm too old for the trip, or the region is over-run by tourism, or the inhabitants find it's just too hard to maintain the rice terraces for which the area is renowned. My Philippine family didn't need too much persuasion to make the journey, even though it involved long car trips over often precipitous roads ominously littered with rocks from previous land-slips. The compensation was that every turn of the road revealed an even more beautiful landscape of clouds, mountains, valleys, ravines, and the rice terraces. People dispute the age of the terraces, but general agreement is that they are around 2000 years old. The walls are constructed of intricately arranged stones, sometimes with mud used for mortar, and they echo the contours of the slopes to maximise the area of each rice-growing segment. Water drains from the top to the bottom of the terraces in an ingenious feat of hydraulic engineering. 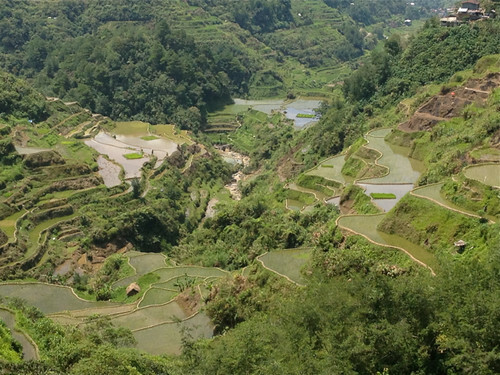 A number of the areas of terraces have received UNESCO World Heritage listing, but to see those you really need to have a four-wheel drive vehicle, or consign yourself to the local overloaded jeepneys, and be willing to trek considerable distances across the mountains. This was beyond our capabilities and we contented ourselves with visiting the towns of Banaue and Sagada and driving and walking to the more accessible viewing points. it's very tempting just to sit and knit and watch the mists and shadows and showers pass across the landscape. Maintaining and farming the terraces is hard work and requires a strong sense of community to ensure that each unit-holder does nothing to unsettle the balance of the ecosystem of the terraces. The inaccessibility of the Cordillera region protected its peoples from Spanish colonisation and minimised the impact of US rule in the first part of the twentieth century. But modern communication technologies and better road access provide wider temptations and opportunities beyond the local for young people. There is some government support for maintenance of the terraces, but I can't help but wonder how they can be sustained into the future. I'm in the Philippines again - this time for my grandson's third birthday. Yesterday we had an excellent lunch at one of Manila's many shopping malls. At this time of the year, when Manila is at its hottest, it's easy to see the attraction of the enormous shopping malls - air conditioning! Most of the malls are so extensive that you can stroll and admire and shop and have coffee (or ice cream) as you would in a suburban shopping street. But it's cooler. Far cooler than outside. The visit to the mall had the added benefit of a small display of woven banig in its vast entrance atrium. 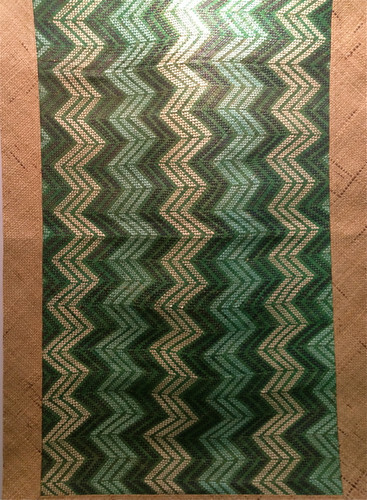 Banig are woven from straw or grasses and traditionally functioned as sleeping mats. They still serve this purpose today, but over time banig makers have sometimes chosen to embellish their mats with colourful and intricate patterns. Nowadays they're as likely to be used for decoration as they are for sleeping. The banig in this display were from Samar, in the central Philippines. I learned that they are woven in Basey - a town renowned for the intricacy and colour of its banig weaving. 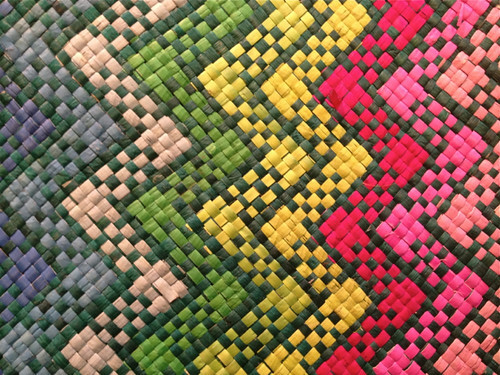 The mats are made from tikog, a grass that is specially cultivated in the nearby province of Leyte. The tikog gives a sheen and pliability to these banig that makes them quite special. 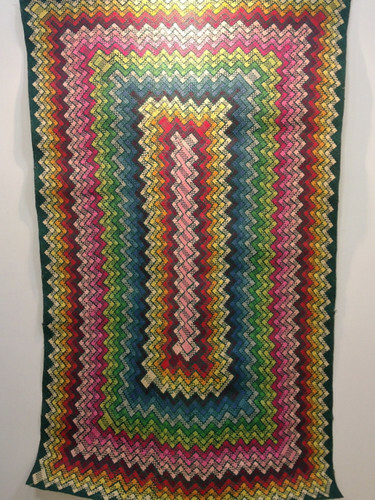 I think the traditions of banig and of patchwork quilts share much in common. Both take materials that are readily to hand and otherwise without value and create useful, necessary, everyday objects. But with both these traditions the makers bring their sense of design and the desire for self-expression to the task. The results are idiosyncratic and often very beautiful.